Amid the big announcement about SUVs, more SUVs and hybrid cars in Dearborn today, Ford gave us REAL CAR-DRIVIN’ PEOPLE what we all really wanted: our first glimpse at the new 2020 Ford Mustang Shelby GT500. Prepare to be on notice, Chevy! What do we know about this thing so far? Not much, besides that Ford has promised it’ll pack more than 700 horsepower, making it “the most powerful street-legal Ford ever.” We’re betting on a supercharger. Power fiends everywhere should be very into it. 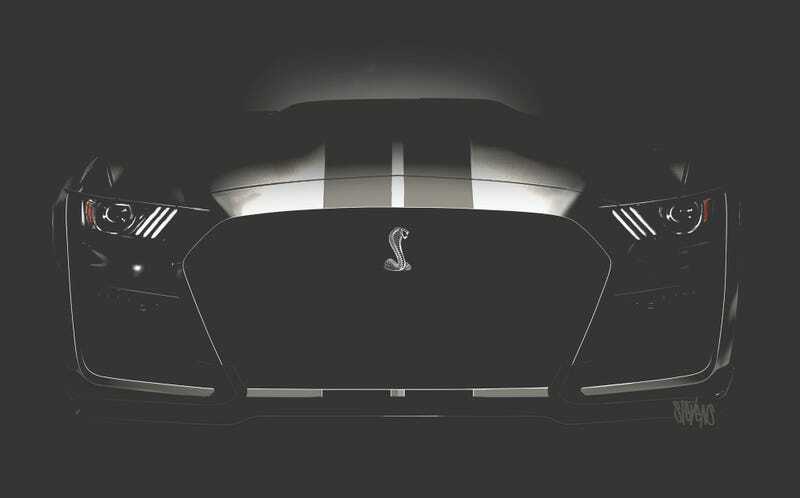 From the teaser pic today (they are good sometimes, like here) we see the top shelf Shelby has a huge, wide, aggressive face—a grille that encompasses almost the entire front of the car. Interestingly, it also keeps the original headlight design of this generation of Mustang, not the one from the refreshed 2019 Mustang. Anyway, the last GT500 was a weapon of mass destruction, and it made do with just 662 HP. We can’t wait to see how this bad boy dials up the horsepower wars even more. Your move, Dodge!